The property sits in a secluded environment near the village of Agioi Saranta with its own private swimming pool and spacious gardens. Villa Marina comfortably sleeps up to 6 people. There are two bedrooms with double beds, and a mezannine above the living room with two single beds, as well as two large sofa beds in the living room. The Villa has three bathrooms - one en suite, one upstairs and one downstairs. The large comfortable living room is equipped with TV, DVD and HiFi and leads directly to the balcony with its spectacular view of Afales Bay. Last but not least, the Villa provides a large and spacious kitchen, leading directly to the garden overlooking the Bay. The Villa is walking distance from the archaeological site School of Homer and from the secluded beach of Afales Bay. It is also 5 minutes driving distance from both the village of Stavros with plenty of amenities, and the fishing village of Frikes with its cafes and restaurants by the sea. I live in Cyprus with my wife and three children. My wife and I both work but in recent years, whenever we find time we escape to the Island of Ithaki, since we have literally fallen in love with the place. We love Ithaki because of its unspoiled and pristine environment, which is complimented by the Island's rich cultural heritage. The island's remoteness from the fuss of the city, its complete stillness and the hospitality of its inhabitants is a wonderful escape from everyday life. Villa Marina is situated in a secluded environment, surrounded by pine and olive trees, overlooking Afales Bay. No matter how many times I have been the views from the property never seize to amaze me. The turquoise waters of the Ionian Sea combined with the greenery of the surrounding forests create unmatched scenery, very difficult to describe. During the day, we either spend time in the swimming pool or walk to Afales beach for snorkelling and fishing. At night, the absence of city lights illuminate the night sky making the Milky Way seem like a breath away. The Villa has three bathrooms, two upstairs (one en-suite in the double bedroom) and one downstairs. The upstairs bathrooms have been completely rennovated in early 2014. The large comfortable living room is equipped with TV, DVD, Hi-Fi and leads directly to the balcony with its spectacular view of Afales Bay. The Villa provides a large and spacious kitchen with all necessary equipment (fridge, freezer, hob, oven, cutlery, etc.) leading directly to the garden overlooking the Bay. Outside: Villa Marina has its own private swimming pool. Couple that with the spectacular views from its balcony and gardens and you will likely be compelled to spend most of your time outside. Utility Room: The utility room is equipped with a washing machine and an iron and ironing board. Cleaning / Towels / Linen / Maid service: The Villa will be thoroughly cleaned prior to arrival. Towels and Linen will be provided and changed once a week. The view from the Villa took our breath away, and delighted us for the whole week. Arrangements were easy and reliable, and the villa contained everything we could need. We found the small idiosyncracies, like the slightly challenging spiral staircase added to the attraction of this exceptionally beautiful place. We had a wonderful time and would love to return, thank you. We really enjoyed a relaxing holiday. The local village had small shops that stocked all you needed. We walked to the restaurant at the top of the road - very good food although Mediterranean rather than Greek. We love the beach at Stavros and the beach front restaurants at Frikes. We were met and guided to the villa. It was clean and spacious and the kitchen well equipped. Britta who looked after the house was full of local knowledge. We have been visiting for lots of years and it never disappoints. 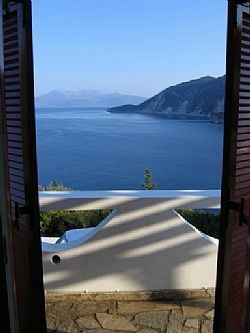 For people who love Greece, stunning views and don’t want/need to be surrounded by houses and people. A friendly very Greek village. Really enjoyed our second stay in this house. Ithaka is very beautiful; there aren't any major attractions, but lots of short walks, and secluded (if pebbly) beaches. The house is comfortable rather than luxurious, but the terrace and pool are really good, with glorious views in all directions. There is a lovely beach only 10 minutes' walk away, but it is still nice to have a pool to cool off without leaving the terrace, Good restaurants within 10 minutes drive (in Stavros and Frikes). The booking and arrival arrangements were efficient and straightforward. We hope to return. This was our third stay at Villa Marina and we have already booked for next year. The villa has everything you'll need for a family holiday and the owner is improving the villa year on year. You'll spend most of your time outside mesmerised by the stunning views, sunsets and sunrises. This is a magical place. There are plenty of secluded beaches on the Island of Ithaca. The closest one to Villa Marina is Afales Bay, situated directly beneath the property. It is a 5 minute walk down on a paved road surrounded by forestry. More information on how to get to Ithaca can be found on our website. The village of Stavros with plenty of amenities is also 5 minutes driving distance from Villa Marina. The capital of the island, Vathy, is about 25 minutes drive from Aghii Saranta. Due to its linkage to antiquity, the Island of Ithaca is flooded with archaeological sites. Perhaps the most important one and walking distance from Villa Marina is the School of Homer, which recent discoveries link it to the elusive palace of Odysseas and Penelope, and stage to the dramatic finale of The Odyssey. Booking Notes: Information on booking procedure, deposit and payments can be found under the "Terms" section of our web site (see link below). Changeover Day: The check in time to the Villa on the arrival day is from 2.00 pm and on the departure day the Villa must be vacated by 10.00 am. The Villa will be cleaned and checked for any damages prior to the next guest's arrival.